Dr. Afifi’s clinical practice covers general plastic and reconstructive surgery, with a special emphasis on partial and total breast reconstruction, surgery for migraine headaches, and microvascular surgery. He also has special interests in aesthetic surgery, including cosmetic breast surgery, facial rejuvenation, and body contouring. Dr. Afifi provides a wide range of services including Botox, Breast Augmentation, Breast Implant Removal, Breast Reconstruction, Breast Reduction, Brow Lift, Carpal Tunnel Release, Digital Replantation, Extended Efforts in Limb Salvage, Filler Injections, Hand Arthroplasty, Liposuction, Lower Eyelid Tuck, Microvascular Reconstruction, Nerve Repair, Nose Surgery (Rhinoplasty), Surgery for Migraine Headaches, Tendon Repairs, Tummy Tuck, Upper Eyelid Tuck. 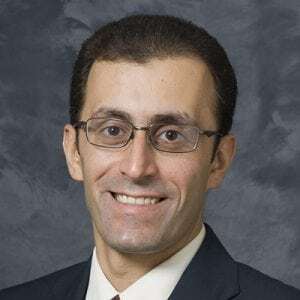 Dr. Afifi’s research interests include outcomes and indications for partial and total breast reconstruction including oncoplastic techniques, functional rhinoplasty, and reconstruction of skull defects. Functional penile replantation after traumatic avulsion amputation below the pubis: A case report. Can Functional Nasal Surgery Treat Chronic Headaches? A Systematic Review. Intralesional immunotherapy for the treatment of warts: A network meta-analysis. Late Correction of Traumatic Nasal Deformities: A Surgical Algorithm and Experience in 120 Patients. Drains in Prepectoral Breast Reconstruction: Show Me the Evidence.